Marching through the Atacama during the War of the Pacific, one Chilean general opined that his troops had fought ‘more against the desert than against men’. For those soldiers, the desert became a hell on earth. Landscape in the Atacama Desert, c.2010. 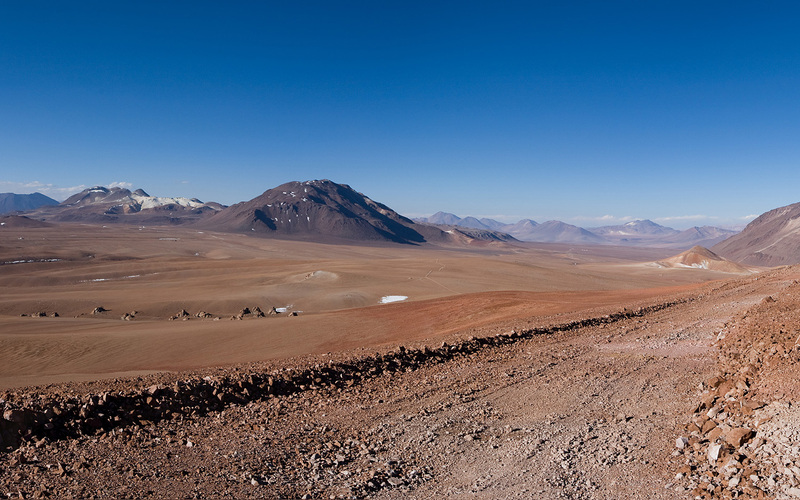 The Atacama Desert is the driest in the world. Stretching over 1,000 kilometres between northern Chile and southern Peru, this arid area is marked by a barren, mountainous landscape with extremely small amounts of rainfall. It seems an unlikely battleground. Yet in the 19th century large deposits of sodium nitrate, or saltpeter, an important ingredient in fertilizers, were discovered in the desert. In 1879, most of these deposits were located in Peruvian and Bolivian territory. Within ten years they would fall under Chilean control, leaving Bolivia without a coast and Peru without a valuable export. War had reached the Atacama Desert. The conflict began as a diplomatic crisis in February 1878, when Bolivia imposed a ten cent tax on nitrate exports by the Chilean Compañia de Salitres y Ferrocarril which had been authorised by the Bolivian government to extract sodium nitrate from Bolivian territory. This act broke an 1874 treaty between the two countries, by which Chile agreed to relinquish claims on territory in the desert in exchange for Bolivia’s promise that it would refrain from increasing taxes on exports by Chilean companies. Negotiations ensued, but a deadlock was reached in December 1878 with a Bolivian ultimatum: if the tax was not paid, company property would be confiscated and sold at public auction. In February 1879 the crisis escalated to war. The company had refused to pay the tax and its property was confiscated in January. The public auction was scheduled for a month later on 14 February, which became the day Chilean troops landed at the Bolivian port of Antofagasta and occupied it. Claiming that the 1874 treaty was nullified by the imposition of taxes, Chile now moved to occupy the territory that it had relinquished. Map of Peru and Bolivia, 1855, by J.H. Colton. The northern Atacama desert is shown as part of Bolivian littoral territory at the bottom of the map. Two weeks later, Bolivia declared war on Chile. 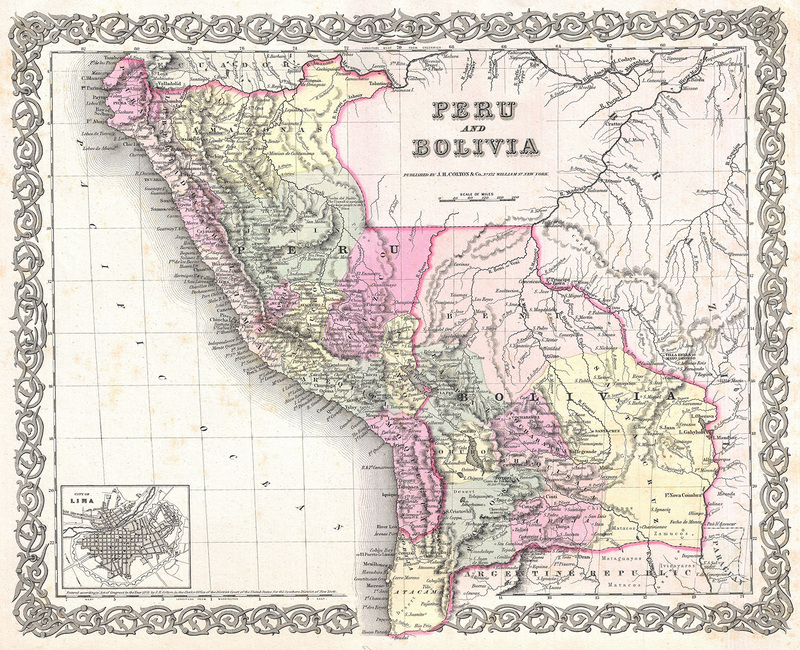 Peru, in turn, was brought into the conflict as a consequence of a secret military treaty that it had signed with Bolivia in 1873. La Guerra del Pacifico would last until 1884. Chile’s victory led to the occupation of Lima by Chilean forces, the rise and fall of new governments in Peru and Bolivia and the annexation of Peruvian and Bolivian territory by Chile, giving the nation a new export that would dominate its economy until the 1920s. Between 1879 and 1881, the war on land was fought in the Atacama Desert by citizen-soldiers barely trained for 19th-century warfare. Chile was completely unprepared for a large-scale war and particularly unprepared to wage war in a desert environment. It had not fought an international conflict since the 1830s, coincidentally against a Peru-Bolivia alliance, and its regular army was busy fighting against the indigenous population of the Araucanía in southern Chile when war broke out. 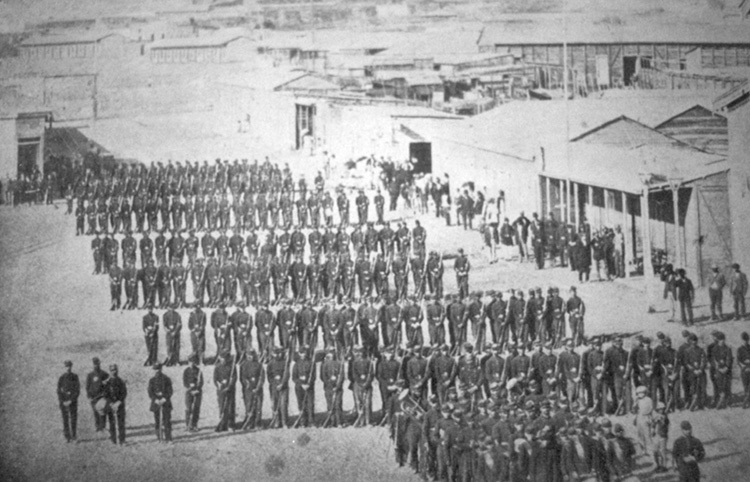 A large expansion of the Chilean army ensued, bolstered by volunteers and conscripts, who were given only basic training in manoeuvres and marksmanship. Chilean strategy required naval invasions of Bolivian and Peruvian territory in the Atacama Desert, with the ultimate goal of denying the two countries any revenue from natural resources found there. Although there were settlements on the coast and in the interior of the Atacama Desert, infrastructure was poor. Marching by foot was often the only means of transportation between camps, settlements and battlefields. Flaws in the logistics of the Chilean army prevented supplies in occupied ports from reaching the ill-defined front in the desert’s interior. Inadequately prepared, long marches in the desert became a life and death struggle where water was the rarest, most precious, commodity. As the Chilean general Manuel Baquedano said, his troops had fought ‘more against the desert than against men’. How did soldiers survive the desert marches? To answer this question, we turn to the words and experiences of Chilean soldiers of all ranks. Whether written while in the desert or 50 years after the fact, the memories of it never left those who experienced it. The soldiers’ uniforms and the equipment they carried made matters worse. 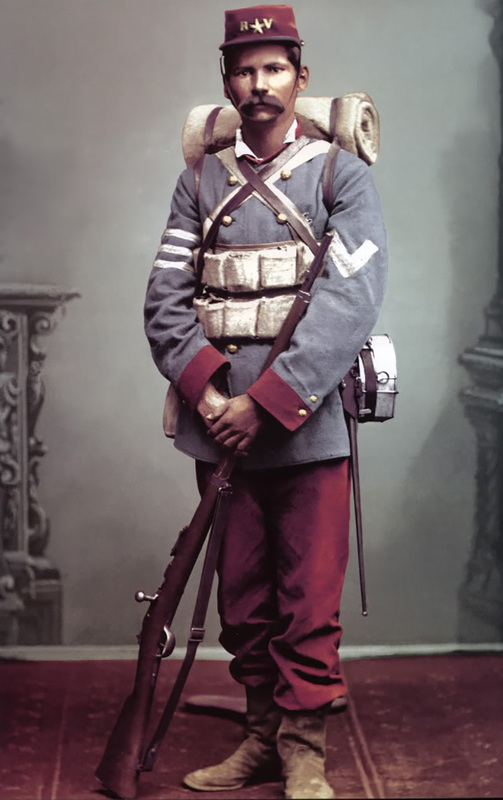 The field uniform, in French fashion, consisted of a kepi – a French military cap with a peak – a dark blue guerrera jacket worn on top of a shirt, red trousers with white gaiters and a pair of simple black leather shoes. The soldiers carried a backpack and equipment, including canteens, ammunition belts and a rifle, although this varied from soldier to soldier. As the marching and the arid heat began to take its toll, the soldiers began to undress and get rid of unnecessary clothing and equipment. Hipólito Gutiérrez from Colton outside of Chillán described how the path was littered with discarded clothing and equipment from a Chilean unit that had passed before. Many men from his own unit decided to contribute to the piles of clothing forming on the desert path. Acknowledging this problem, Chilean military authorities developed a new uniform adapted to the desert. Unfortunately for the soldiers, by the time it was introduced in 1880, the war had moved away from the desert to the mountains of Peru. In memoirs, journals and other personal recollections, no soldier mentioned a method of protecting themselves from the heat. The uniform they wore covered most of the body but hands, face and neck remained exposed. ‘The sun burned with an intensity that created painful rashes and not even the smallest breeze could be felt that could cool the atmosphere of fire,’ wrote Benavides Santos. After hours of marching, lines became disorganised. Sometimes a break every 20 or 30 minutes was provided to give the soldiers an additional opportunity to rest. Gutiérrez wrote that upon being granted a break, ‘we laid down like corpses’. Many soldiers simply gave up and collapsed while their comrades marched on. Lieutenant, how are you keeping up? And Captain X? Looks like he’s about to give up! ‘More than a thousand jokes in their individual and particular styles’ were exchanged between soldiers according to del Solar. Despite this, after four hours of marching through the desert, laughter and jokes were replaced by exhaustion and curses aimed at Peru and the Atacama Desert. The biggest issue was thirst. 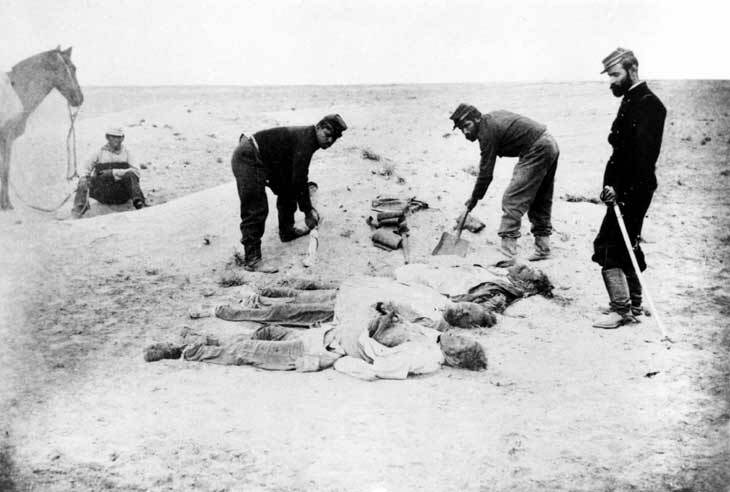 Although hunger is mentioned in the writings of the Chilean soldiers, it pales in comparison to thirst and exhaustion, usually mentioned in the same sentence. The expression muerto de sed (dying of thirst) was a common expression. It was something that the soldiers felt powerless against as their canteens began to dry out. Some, like Gutiérrez, mention that they carried several canteens on the march, which carried more water but also weighed them down further. No matter how much water a soldier brought with him on a march, it was impossible to keep it cold, though lukewarm water was a small inconvenience compared to being without water at all. To trick their thirst, some men put bullets in their mouths and others drank their own urine… I also tried to do it with a piece of chancaca [a solid form of unrefined sugar] that I had left and that I patiently melted, but I couldn’t drink it because I felt sick trying. Another soldier asked to have it and drank it as if it was crystal clear and fresh water. Thirst pushed soldiers to their limits. Gutiérrez feared the most serious consequences: ‘We were afraid of what had happened to other units that had walked here would happen to us. Many had died of thirst on these vast plains without help.’ Gutiérrez wrote that three men in the Caupolicán battalion had died of thirst. His Chillán battalion ‘was lucky that no one had died’. 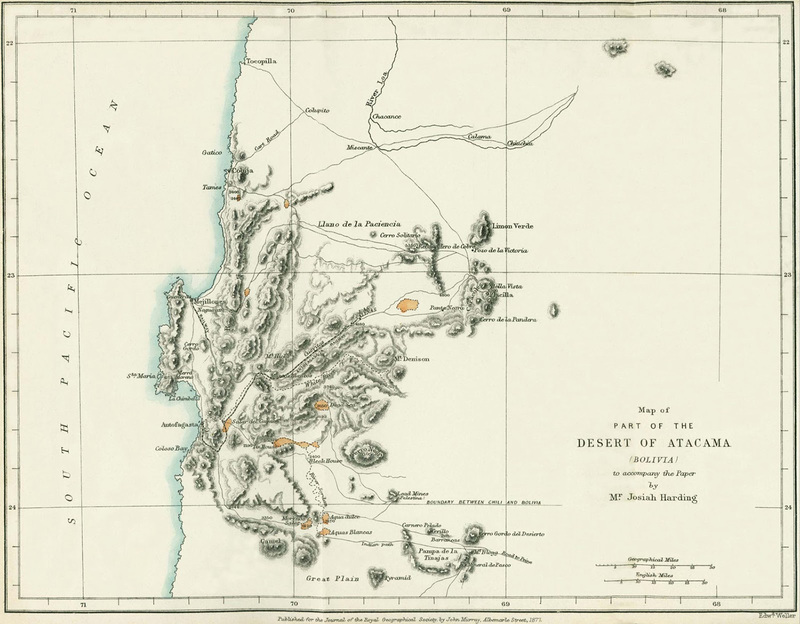 Map of the Atacama Desert, then part of Bolivia, 1877. After walking for a short while, we heard a rifle shot, something that alarmed us since we believed that we had walked into the enemy. When we turned our heads around we saw my brother’s assistant on the ground. We approached him with our revolvers at the ready since we assumed that we had fallen into an ambush. The soldier was dead: his skull was in pieces; the bullet had entered from beneath his beard. The poor man had killed himself with his own rifle. Thirst had driven him mad. Half an hour later we were at the water tank and told our colleagues about the, to us, painful incident. The desert night posed different challenges. The unbearable heat of the day was exchanged for freezing cold. Soldiers who had previously discarded parts of their uniform now regretted their impulsive choices. Arturo Olid Araya, a teenager serving with the Artilleria de Marina, remembered how he waited for daybreak with only a coat to shelter him from the cold of the night. He looked with jealousy at his captain, Carlos Silva Renard, who, with the help of his sabre, made a bed from a hole resembling a grave in the ground that he covered with blankets. Olid Araya was not forgotten by his captain and was soon asked to join him in the improvised bed. Benavides Santos gathered together with the sergeants from his company and created a tightly packed group. Santos remembered: ‘I felt no cold because I had placed myself in the middle and I soon fell asleep.’ Another way to keep warm during the night was to use a stone as a pillow and bury your body with ‘lukewarm sand’. Not everyone had the opportunity to stop or sleep during the night. Many soldiers continued the long march that had begun during the day and that became increasingly harder to handle due to the fall in temperature. The marches did finally end for those who managed to endure it. For the lucky ones, it might end at a camp or a settlement where they could replenish their tired bodies with food and drink and get some sleep under cool shade. For less fortunate soldiers, their end destination was the field of battle. From the battlefield of Calama in 1879 to Arica in 1880, the majority of the war’s conventional battles were fought in the desert. In these engagements, soldiers were faced with the same choking dust and scorching sun known to them from desert marches, while also facing the horrors and chaos of a set-piece battle. Despite this daunting prospect, soldiers appeared to become energised when approaching the enemy. Gutiérrez described the mood among soldiers who marched towards the Battle of Tacna (26 May 1880), one of the war’s pivotal battles, as happy and festive. Many considered battle as better than spending another moment marching through the unforgiving desert. With the exception of the Battle of Tarapacá (27 November 1879), Chilean forces won all the major engagements fought in the Atacama Desert. With each Chilean victory, the campaigns moved further north. Despite the successful occupation of Bolivian and Peruvian territory in the Atacama Desert, it would ultimately require the occupation of Lima, the capital of Peru, and an ensuing counterinsurgency campaign lasting until 1883 before Chile could claim total victory. By the time the war moved to the Peruvian sierra, the lifeless Atacama Desert had witnessed bloodshed the likes of which it had never seen before or since. Stefan Aguirre Quiroga is an independent researcher based in Borås, Sweden.